based on Magnetic 2.3 by Niclas Karlsson, David Kinder, Stefan Meier and Paul David Doherty. JMagnetic is written by Stefan Meier. 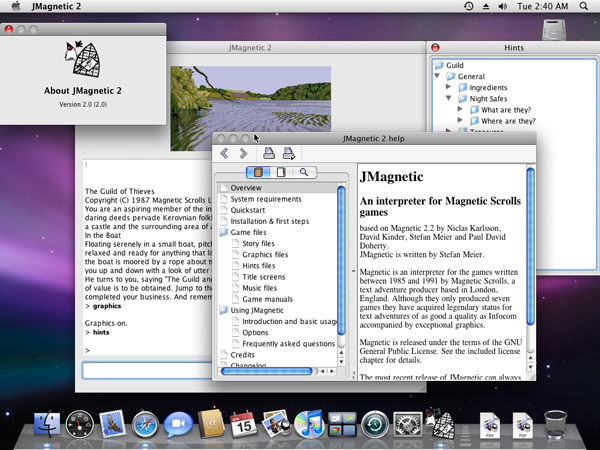 Magnetic is an interpreter written in Java for the games published between 1985 and 1991 by Magnetic Scrolls, a text adventure producer based in London, England. 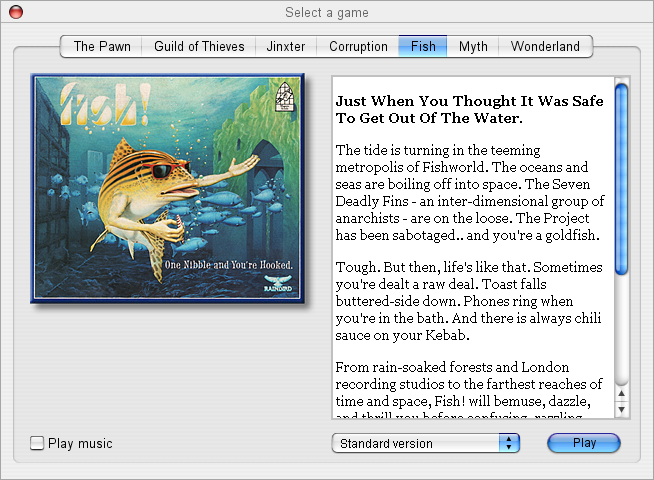 Although they only produced seven games they have acquired legendary status for text adventures of as good a quality as Infocom accompanied by exceptional graphics. More about the original Magnetic interpreter is here. Before starting the installation, please verify that you have a Java Runtime installed that is fully compatible with SUN JRE 1.4.2 or newer. A Java 5 or 6 runtime is highly recommended. On Linux the gcj runtime is not sufficient!. Install JMagnetic by double clicking the installer or execute the command 'java -jar JMagnetic2.3.2inst.jar' in a shell (or use "Open with SUN Java..." on some Linux installations with Gnome or KDE). Select the game you want to play. Use the commands 'save' and 'restore' to keep your game progress. 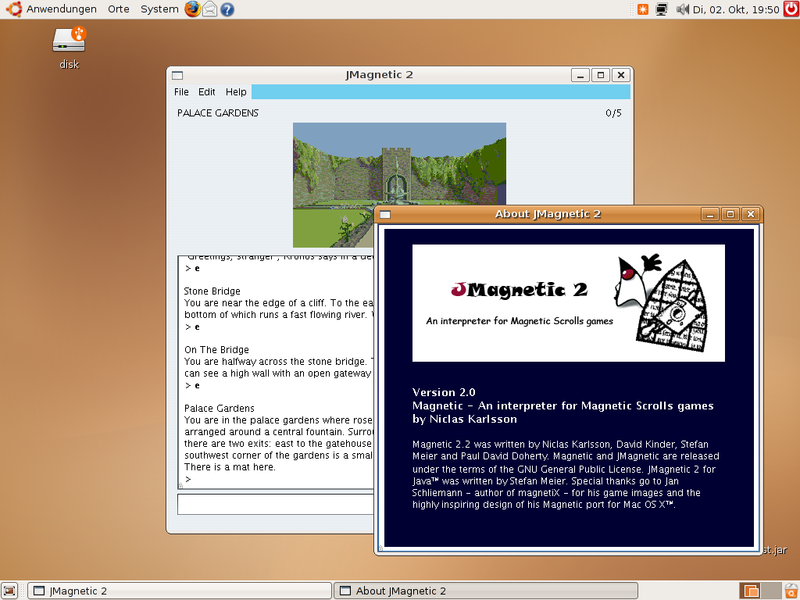 Magnetic 2.x development, Windows, MS-DOS (32-bit) and Amiga ports, for the extensive documentation of the Magnetic ports for DOS and Windows, which provided the base for the JMagnetic 2 help file and for maintaining the IF Archive, the central site on the Internet for text adventures and related interpreters, compilers and other tools. author of Glassworks and Helpmaster, for his great help with building and testing the JMagnetic installer. Java Virtual machine, compatible to SUN's Java Runtime 1.4.2 or higher and capable of running Java Swing applications. A Java 5 or 6 runtime is highly recommended. 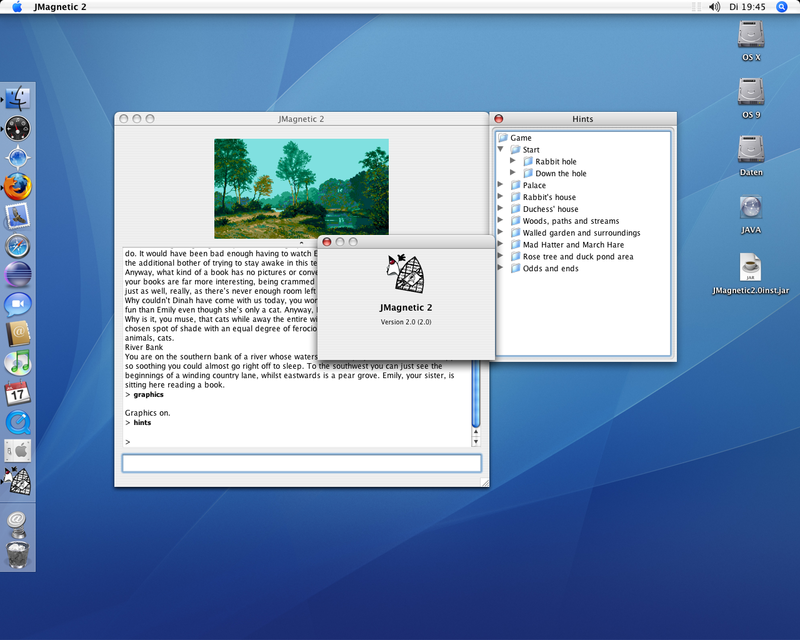 Magnetic is released under the terms of the GNU General Public License v2.